Home > JULY 2016 > Make Freshly Baked Bread at Home Every day! Make Freshly Baked Bread at Home Every day! Breads are a daily dose of our health. It is one of the oldest prepared foods internationally. From tender sandwich bread and crisp/crunchy baguettes to delicious banana loaves, breads have been loved by one and all. Nutritionally, bread is known as an ample source for the grains category of nutrition. Serving size of bread is standard through ounces, counting one slice of bread (white processed bread) as 1 oz. Also, bread is considered a good source of carbohydrates through the whole grains, nutrients such as magnesium, iron, selenium, B vitamins, and dietary fiber. As part of the 2010 Dietary Guidelines, it is recommended to make at least half of the recommended total grain intake as whole grains and to overall increase whole grains intake. Wonderchef cookware and appliances are the new age trendsetters, making everyday living a delight with healthy and easy cooking solutions. 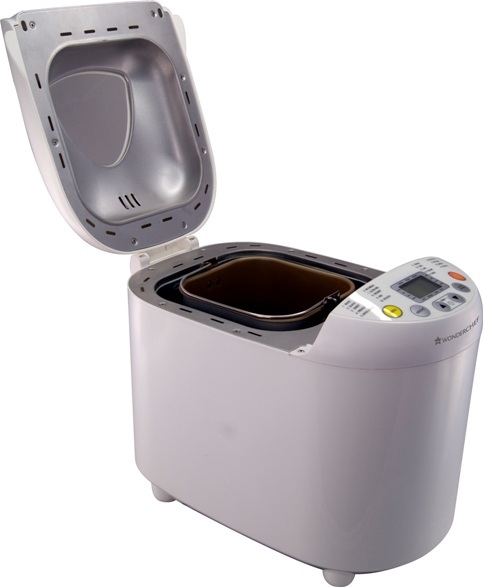 Wonderchef now introduces the healthiest home cooking bread maker. Now making quick n easy loaves is just a few minutes’ job. The new Regalia Bread Maker makesthe most freshly baked regular breads to gluten-free multi-grain breads, cakes, jams, handvo and much more within just a few minutes.Knead everyday Atta too without dirtying your hands, in a smooth and clean manner. Simply add the ingredients, choose from different menu options and make the bread for the mood. Also what comes along with this Bread maker is a recipe book of Chef Sanjeev Kapoor’s exclusive recipes especially designed for Indian taste. The recipes blend well with the Indian Ingredients and the natural Chakki Atta quality with low gluten content. For health conscious freaks, this is the ultimate choice of indulgence.MakeHigh-fiber breadswith whole-grain soluble fiber to reduce a rise in blood glucose levels while also slowing digestion. Make Grain-free breadfor gluten free living with coconut flour, tapioca flour, almond flour, and flaxseed.Or make Multi-grain bread with whole, unrefined grains, including buckwheat, brown rice, bran, barley, oats, and quinoa. These grains are lower on the glycemic index than wheat flour. With Wonderchef, goodness and wellness in homes is a promise. Wonderchef is India’s premium kitchenware company born out of the ‘love of cooking’. Driven by passion of making Kitchen the Centre of wellness and goodness in homes, Wonderchef was created by two enthusiasts, Mr. Ravi Saxena and Chef Sanjeev Kapoor in 2009. They believed in kitchen being the 'heart of our home', as it inspires us every day to create lasting memories with the food we cook for our loved ones. This is why the entire range of Wonderchef Cookware and Appliances is a perfect blend of health, taste and convenience that inspires us to 'cook with pride'. Wonderchef products are used in millions of homes in India where healthy and convenient cooking is a part of lifestyle. Selection of products have been specially designed by Chef Sanjeev Kapoor to meet the fine taste of India’s discerning consumers, who now want the best. Wonderchef constantly endeavors to create modern solutions for today’s woman, making it the ‘most loved Kitchenware Company' in India. All products are developed across Italy, Korea, UK, Germany, China, Canada and USA. They are sold to Indian customers across 2000 towns and cities through Retail, Television Marketing, Internet, and via a dynamic channel of over 45000 self-employed, motivated & trained women.